Are you looking for hotels in Derby? If so, look no further than JC Hotels! We have a beautiful hotel name Littleover Lodge situated in the charming village of Littleover, Derby. A former 1850’s farmhouse, Littleover Lodge is brimming with character and history making it the perfect choice when looking for hotels in Derby. The ground floor is now home to the Lodge Bar & Dining, one of the leading cocktail bars in Derby, a contemporary decorated restaurant, hosting a freshly produced gastro menu and an incredibly popular home cooked carvery. The hotel also features 15 ensuite bedrooms which are furnished with modern comforts. Put simply, Littleover Lodge has everything that you could possibly need for a fantastic stay! With only 15 well-equipped rooms available to book, you can rest assured that the hotel will never be too busy, meaning you and you guests can relax completely. 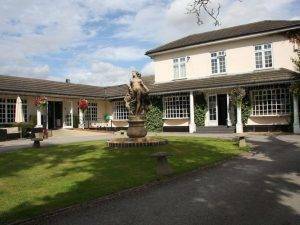 Whether you’re looking for hotels in Derby for a romantic weekend away with your special someone, you’re away on business or you simply fancy escaping for a few days, Littleover Lodge is a perfect choice! With a delicious gastro menu, reputable carvery and an authentic stone baked pizza oven, you will never be stuck for choice when dining with us either! From the pillows you sleep on, to the last drink before bed, you’re guaranteed exceptional service and a trip to remember when you choose our hotels in Derby! We are a family hotel in Derby and children and pets are always welcome but we do ask that pets are kept away from public food and drink areas. If you would like to book a stay at our hotels in Derby, or you would like more information, then please do not hesitate to get in touch! A member of our friendly and welcoming team will be more than happy to help! As one of the leading hotels in Derby, you are guaranteed a fantastic stay and the warmest welcome as soon as you step through the door. Please note that one some days we are closed for weddings, you can view these dates online here.